Large corporations are taking a more active approach to managing their energy. Apple recently made headlines when it established a subsidiary called Apple Energy and filed for authorization to sell capacity, energy and ancillary services in wholesale energy markets nationwide. It will be some time before we see Apple participate in many of these markets, since Apple’s application currently covers only its renewable energy projects in California and Nevada, as well as one under construction in Arizona. But the fact that a consumer technology company has formed an energy subsidiary reflects the extent to which large corporations are taking an active approach to energy management. As Apple and other corporations pursue new opportunities in energy management, their objectives generally include some combination of cost management, sustainability, predictable costs and resiliency. Though Apple is the most recent tech company to establish an energy subsidiary, two of its competitors were there first. Google established Google Energy at the end of 2009, and Amazon established Amazon Energy in mid-2015. These subsidiaries were formed to “identify and develop opportunities to manage the cost of energy,” a complex endeavor for corporations with a global footprint. At a macro level, regional variation in energy regulations and rates complicates a corporate-wide approach to energy procurement. And at a micro level, costs are closely linked to the overall energy consumption of an individual facility and to when the facility uses energy throughout the day. The financial opportunity available goes beyond simply reducing costs. The authorization that Apple seeks -- and that Google and Amazon already have -- to sell electricity to wholesale customers would permit it to earn market revenues from the renewable energy projects it has invested in. Even without investing in onsite or offsite renewable resources, commercial and industrial (C&I) customers can earn revenues by participating in demand response, shifting the time of their electricity consumption in exchange for payments from a utility or energy service provider. There are clear economic reasons behind the choices that Google, Amazon and Apple have made to better manage the cost of energy. Equally important to their overall energy strategies, however, are their sustainability goals. Apple, Google and Amazon Web Services (AWS) all have long-term goals of generating or purchasing an amount of renewable energy equivalent to the amount of energy they consume overall in their stores, offices and data centers. Achieving aggressive sustainability goals isn’t possible with the types of energy projects that companies typically pursue. 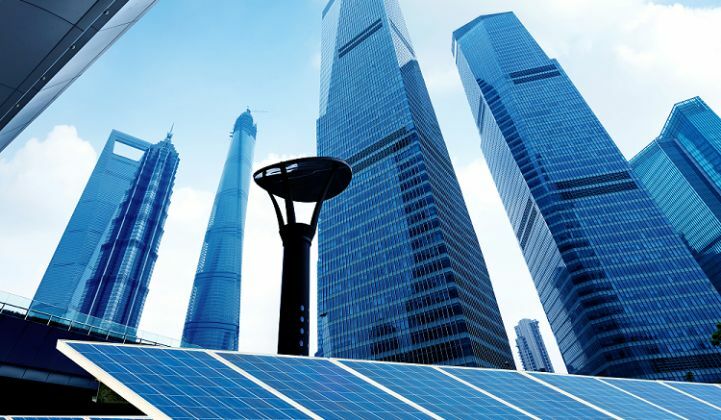 Standard lighting retrofits and onsite solar installations can effectively address significant shares of a facility’s overall energy consumption, but a more comprehensive assessment of energy efficiency and renewable energy options is necessary to meet corporate-wide goals as high as 100 percent renewable energy. With this in mind, Google has implemented measures to make its data centers 50 percent more efficient than a typical data center. This enables the company to right-size its renewable energy investments and avoid buying or generating electricity that it could cost-effectively avoid consuming in the first place. As corporations diversify the sources of their energy, incorporating large-scale solar and wind resources in their procurement plans, they also seek to make energy spending more predictable. While power-purchase agreements give customers visibility into the price of solar or wind power over the life of a 10- to 25-year contract, the revenue that customers can earn from reselling the electricity into wholesale markets is less predictable. A recent contract highlights the priority that AWS in particular has placed on predictable energy costs. AWS’ data centers in Virginia were paying a relatively fixed rate for energy, while the company’s renewable energy projects were earning variable revenues in the wholesale energy market. This volatility led AWS to negotiate a new rate with its utility, Dominion Virginia Power. The new rate ensures that AWS will pay a lower bill to DVP when wholesale energy market revenues are low and pay a higher bill when market revenues are higher -- thereby keeping overall energy cash flow more consistent for AWS. The destructive storms of the past several years have led both the public and private sector to invest in more resilient infrastructure, but resiliency is not a new concern for Google, Amazon and Apple. To ensure that data centers can continue to operate during power outages, backup generators that run on diesel and gas are common. Hospitals, food storage facilities and laboratories, similarly concerned with the highest level of resiliency, have also traditionally relied on such generators. Today, rapidly falling battery prices enable a new and potentially cleaner way of maintaining an uninterrupted supply of power. This is one reason Microsoft is exploring the potential of battery technology at its data centers. The complexity of meeting corporate energy objectives presents an opportunity for energy service providers. Their core value proposition is to simplify and streamline the procurement of energy and the selection, financing, installation and operation of energy technologies. Incumbents like Ecova, EnerNOC, GE, Schneider Electric, and Siemens have been active in the C&I market for years, but are beginning to incorporate onsite energy generation and storage with their core energy management offerings. Meanwhile, some of the largest energy companies in the world -- including Centrica, Duke Energy and Edison International -- have made acquisitions that position them to compete directly with the incumbent providers. As Google, Amazon, Apple and other leading corporations scale up their energy management initiatives, a growing number of service providers is betting that many more corporations are soon to follow. To find out more about the GTM Research report The New C&I Energy Management Landscape: Integrating Procurement, Efficiency, Generation & Storage, please click here.